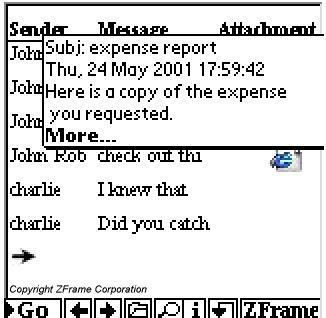 In 2001, I left my first post-college job at PinPoint Corporation to work for a start-up called ZFrame. A long-time colleague of mine was one of the co-founders and our somewhat ambitious goal was to write the next (you could almost argue, the first) major web browser for the PalmOS. First of all, the product was amazing. It was pretty cutting edge and nobody else had anything like it at the time. Second, we had a great team with some really sharp developers. Third of all, I got to work from home full-time for 2 years. 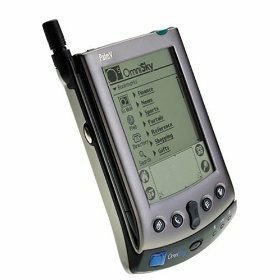 This was a pretty major undertaking considering the state of mobile computing in 2001, the pinnacle of which was the ubiquitous Omnisky modem for the Palm V.
We struggled along for a couple of years trying to find our niche before finally running out of money and closing shop. 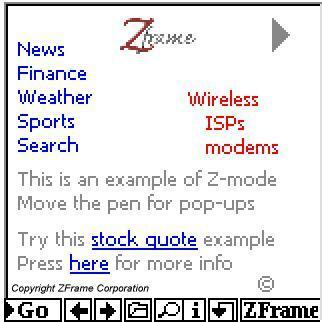 ZFrame was my first failed start-up (although just barely since PinPoint went under a few months after I left) and I'll always remember it fondly. 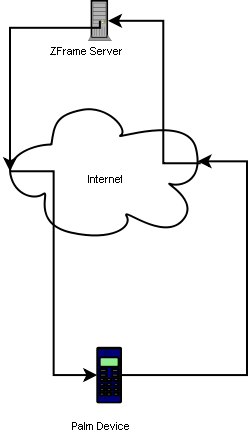 There were several levels to the architecture behind the browser. We had a proprietary program that turned regular web pages into a special, compressed image that contained all kinds of meta-information about the page. This program could be queried via a Classic ASP web service. The PalmOS program called out the web service to retrieve the compressed page data which it then manipulated and displayed in various ways. There was also a load-balancing component to the server-side so we could have a number of page compression programs running on multiple machines (mainly to handle the crushing user load that never materialized). 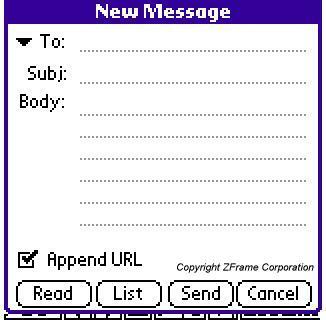 The PalmOS application was written in C using Metrowerks Codewarrior for PalmOS. Most of my CS classes in college used C but this was the first time I'd written production C code and writing for the PalmOS posed a number of interesting challenges, the main one being small memory space. For better or worse, our strategy for dealing with memory was to allocate all of the memory we could possible use right when the application started. All of the rest of the code would then use chunks out of this pre-allocated block. This approach would have been tolerable if we'd written some common malloc/free-like functions to keep track of what parts of this giant block were in use. No such luck there though. We relied entirely on discussing, verbally, what range of the memory block someone should use. As you can imagine, this caused all kinds of fun bugs when one part of the program would start overwriting the memory used by another part (although we did manage to get those worked out before the app actually shipped). There also problems with code segements getting too large so we were always having to move code around. Eventually the entire application got too large and we had to move part of the functionality into a second app that got launched transparently for some operations. As far as using the browser went, you entered a url and the Palm device would initially display a high-level overview of a page which you could drag the pen over. The drag action would then pop up links and little snippets of text. (For a more complete feature overview, check out the UI demo). You could also zoom in on different areas of the page to see the page in high resolution. The above view was good for graphics-heavy areas of pages but not so good for large quantities of text. For that, we had a Text View mode. 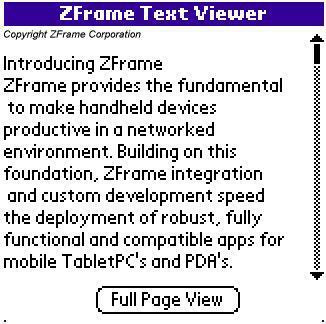 The Text Viewer was my first assignment after I got hired to ZFrame and served as my introduction to PalmOS programming. I wrote C module that was handed a big block of text containing a limited number of HTML tags. I had to parse the text and render it on the screen taking the HTML into account. The only tags I had to handle were <p>, <br>, <b>, <i>, <u>, and <a>. I also had to keep track of links so they could be clickable, including highlighting the links when the pen was dragged over them. I spent about 3 weeks working on the Text Viewer and more than half of that was on making the text scrollable. The biggest problem was the viewer was too slow if I tried to parse all of the text at once. In the end, I settled on parsing 2 screenfuls of text on the initial view. The viewer would the parse a few more screenfuls each time the user scrolled down a page. Each processed page was kept in memory so scrolling up and down after the initial parsing was pretty fast. I also ended up implementing a simple double-buffering scheme to prevent flicker when changing pages. In all, working at ZFrame was a fantastic experience. I learned a ton about C programming and working in an environment with pretty restricted memory. It was also good from a personal standpoint because, since I was working from home, I had to make sure that I stayed focused and organized to hit all of my deadlines.